According to a claim in the Turkish media, Fenerbahce will not redeem Andre Ayew from Swansea City at the end of the season. The Ghanaian international is currently on loan with the Istanbul club following Swansea City’s relegation to the Championship last season. Sabah have reported on the latest developments with regards to Ayew’s future at Fenerbahce and it’s looking very likely he will return to Swansea City in the summer after their manager Ersun Yanal informed the board the player isn’t in his plans. 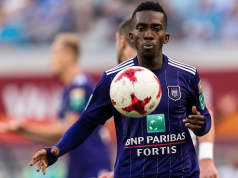 During the last transfer window, the Super Lig side found an agreement with Swansea so they could purchase the attacker outright for €17m, but this no longer seems an option. Fenerbahce are currently experiencing one of the worst seasons in their history and find themselves in a relegation fight going into the second half of the campaign. The Swansea City player has started 16 league games for the Yellow Canaries, scoring just 3 goals. Ayew is contracted to the Swans until June 2021.